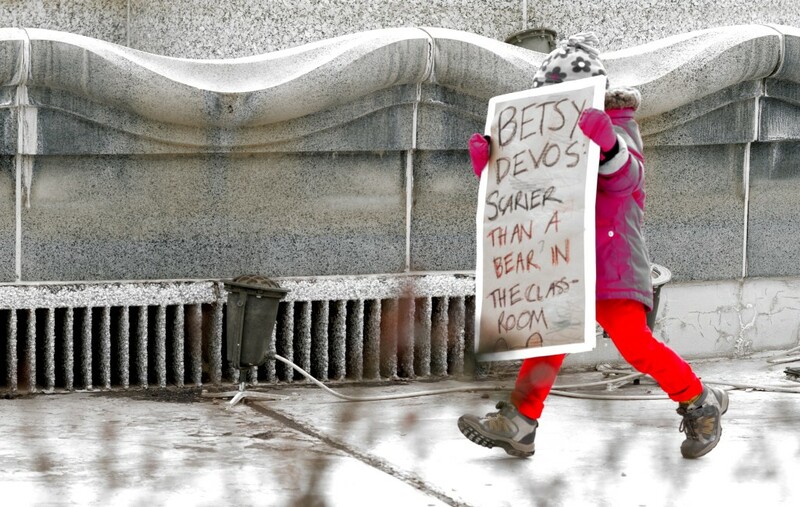 Image: “Protest of Betty DeVos,” by Victoria Pickering, used under CC BY-NC-ND 2.0. Edited. Since announcing his campaign, Trump has used a rhetoric that has proven to be divisive and harmful in very real ways to black and brown, immigrant, and LGBTQ students across the country. The days after his election were particularly dangerous for these students. In just the ten days after the election, the Southern Poverty Law Center (SPLC) reported nearly 900 hate incidents in almost every state. The report notes that this number is undoubtedly lower than the actual count, since it does not include online harassment and many incidents go unreported. The report also found an unsettling, if not surprising, trend in the reports of violence and harassment: K-12 schools and college campuses were among the most frequent sites of these hate incidents. From creating toxic school environments to pushing for the privatization of public schools, Trump is ensuring that marginalized students will only become more marginalized. Although bullying in schools is nothing new, school psychologists, teachers, and parents report overwhelming anxiety in students, as well as an increasingly negative atmosphere in schools since the election. Over 10,000 teachers, administrators, and others who work in schools responded to an online survey as part of SPLC’s Teaching Tolerance Project in the days after the election. Ninety percent of respondents reported that their “school climate [had] been negatively affected,” citing students’ anxiety about the future of their families, the increased use of hateful and derogatory language, the appearance of images of swastikas and confederate flags, and even assaults on students and teachers. Unfortunately, some students are following Trump’s lead in using racist, sexist, xenophobic, and homophobic language under the guise of not being “politically correct.” Educators report emboldened displays of bigotry, such as students holding up a Confederate flag during the pledge of allegiance at a school assembly in Arizona and students in Minnesota writing things such as “send the Muslims back because they are responsible for 9/11” on their assignments. The recent confirmation of Betsy DeVos as Education Secretary further undermines any confidence that marginalized students might fare better in the days to come—even if educators were able to turn around the toxic environment in schools. DeVos considers herself qualified to lead the Department of Education despite the stunning lack of understanding of public education she demonstrated in the confirmation hearing and in her written responses to a questionnaire. She appeared not to understand the difference between student growth and proficiency, became “confused” about federal law supporting students with disabilities, and inflated the graduation rate of students in virtual charter schools. Betsy DeVos has a history of championing school choice and privatization through her political action committee, All Children Matter, and her work with the American Federation for Children. She is among many who frame the neoliberal push for privatization of public school under public-friendly themes such as “racial justice” and “empowerment” through “choice.” This is a rhetoric that invokes “race” but fails to examine underlying systemic racial inequalities. Privatization of public schools has proven to benefit not poor students of color, but only hedge funds and others, such as JP Morgan and Facebook CEO Mark Zuckerberg, who invest in them. Research shows that charter schools and vouchers have done little to even the playing field or to desegregate highly segregated urban schools. In fact, in 2010, the UCLA Civil Rights Project commissioned a large-scale study that included 40 states, the District of Columbia, and several metropolitan areas. The results showed that charters are just as deeply segregated as their traditional public counterpart. Additionally, on the whole, there is no evidence that charters perform better than traditional public schools. Despite DeVos’s insistence that virtual charters are beneficial alternatives, research shows that students at cyber charters consistently underperform. Similarly, vouchers, which provide public money for students to attend private schools, have produced mixed results in furthering student success and achievement. Indeed, vouchers began as a way to circumvent federal mandates to desegregate schools and are now predominantly used by white, middle-class families to send their children to private (sometimes religious) schools, while students of color are left out. The days following Trump’s election have proven to be contentious, even dangerous, for marginalized students across the United States. Schools have become sites of hate, bigotry, harassment, and violence where students of color, immigrant students, and LGBTQ students do not feel safe. Trump has chosen an Education Secretary so unqualified and so controversial that Vice President Pence had to cast the tie-breaking vote to confirm her. The neoliberal agenda to create an educational marketplace where students are commodities will further the marginalization of students while hedge funds and corporations will continue to reap all the benefits. Trump has ensured that schools will benefit primarily white, middle to upper class, heterosexual students, leaving the rest to join the many other vulnerable groups that will suffer the consequences of his election. Gooden, M., Jabbar, H., & Torres, M. 2016. Race and school vouchers: Legal, historical, and political contexts. Peabody Journal of Education (91): 522–36. Lipman, P. 2011. The New Political Economy of Urban Education: Neoliberalism, Race, and the Right to the City. New York: Routledge. Ravitch, D. 2013. Reign of Error: The Hoax of the Privatization Movement and the Danger to America’s Public Schools. New York: Random House. *Sylvia Mac is an Assistant Professor of Education at the University of La Verne. Her research interests include neoliberalism, market-based school reform, and the intersection of disability, race, and class. This entry was posted in Uncategorized by Social Justice. Bookmark the permalink.